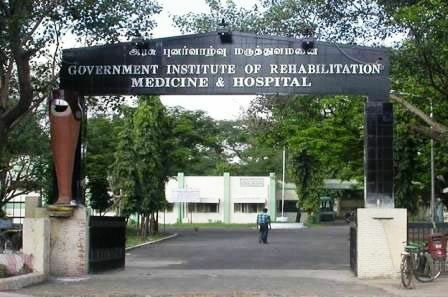 Government Institute of Rehabilitation Medicine is a comprehensive Rehabilitation centre for physically challenged persons. It is one of the biggest Rehabilitation Centers in India providing Medical, Social and Vocational Rehabilitation of the Physically Challenged persons with 30 years of service in disability sector. The Institute is situated at the main road in K.K.Nagar, Chennai in an area of 103.82 grounds with the easy approach of physically disabled persons with grants from Government of Tamil Nadu. The Institute is a premier referral center for medical rehabilitation and is affiliated to madras medical college, Chennai.